Just moved. My 150 tank started as saltwater fish only in 1992. Moved it in 2001 and made it a reef tank. The recent move to the new house was difficult. The first company I hired to move it walked away when they got there. I found another company and was up-front with how established the tank was and sent them lots of photos. They said no problem and could do it two days before my old house closing. They showed up and the guys called their boss and they got in their cars and drove off. I negotiated to pay more to get them to stay and they said they would not set the tank up at the new place. I was out of time and had no other options. We tried to keep all of the coral alive in plastic bins till they could come back two weeks later. The temp pump we were using died. I the pump replaced the same day but nothing survived. I have been slowly adding some corals but it will take some time to fill in. Very nice location. Sorry to hear about your other tank. Looking forward to seeing this get established. Do you mind letting us know who you tried using? Interests:My 4 kids and soon to be a grandfather. Not much time for anything else. And of course my reef, which is my sanctuary. I would rather not say who the mover was; don't want to give them a bad review. They sent 3 guys and I worked on it all day as well. One of the guys had to leave mid-day. The guys were knowledgeable and hard working for the most part. I don't totally blame them for the loss. The old set up was packed in under the tank and also had some equipment in the basement under it. I did tell them I was concerned about the decrease in bacteria on the temp setup. They dumped the gravel floor and stored the deep sand bed in five gallon buckets, not on the temp set up. I was also concerned about lighting, only the stuff on the top of the plastic container was getting light. It was running ok for a few days and I would check on it regularly. When the pump died it was only down for a max of 8 hours. Ran to Home Depot and got a pond pump. When it was back up the skimmer was going nuts and it smelled like death. I removed all of the dead fish and inverts. Did a 50% water change but the skimmer keep going crazy and still smelled bad. All of the coral was slimy and very sad. I sent some photos the the moving company and asked if they could come sooner to set up the tank. They said it looked like it would be ok and could get there in a few days. When they got there a few days later they drilled the tank for the new overflow and put in the new gravel in. After they put in some base rock pieces in they said they were done. I asked about moving in the coral into the main tank, it looked pretty beat up but I was hoping some of it would recover. They said that I should just throw all of it out. After they left I picked through it and moved some of the better looking pieces into the main tank. There was nothing else living in the main tank so I didn't have anything to loose. None of it ever recovered. When the guy came back a week later to pick up his final check he gave me five or six fags to help get me started. Again, I don't want to blame the loss on just the moving company. They have gotten nothing but good reviews here on WAMAS and my tank was difficult. Any recommendations on restocking? I like Steve's Tropical Lagoon in Silver Spring. I have been going there since around 1985 or so. Join the forum so you can access the sales pages. To be honest, with your story and that sick setup you will have plenty of people offer you free frags (or very cheap) of soft corals like the ones in your tank prior to the move. If that's your thing. That new setup is so awesome. Love it behind the bar like that. Welcome to WAMAS, rdavidw. Glad to have you aboard now as a member. Great tank! Sorry if off topic - replying to the basement in general comment. Not too much to look at in the tank yet but looking forward to changing that. What little I do have seems to be doing well so far. My old tank was very overgrown so this is a nice change. I was being sarcasm! Your other hobby overwhelm the tank. awesome basement btw. I am sure your tank will be the center of attention once you get it back to where it was. love the set up. what kind of beers do you brew? Don't want to get too far off topic, but the beer and the urinal do complement the tank well. I make 5 gallon batches at a time, from water grain and hops. I also make wine. On the six taps, I typically keep a mead, an apple wine, two dark beers, a lager and a big IPA. The two hobbies play well together. Both are part art and part science and you can get great results using mostly one or the other. I started with a salt tank back around 1990 and started making beer and wine a few years after that. I had a part time job just out of collage working in a winery. We're off topic now! Nice to have another home brewer. I agree the science does cross over in both hobbies! I had an old 10gallon system that simply took up too much space, so I recently switched over to an all in one Grainfather. It's revolutionized space for me, and I'm a little upset that they just released the 70L one last week. 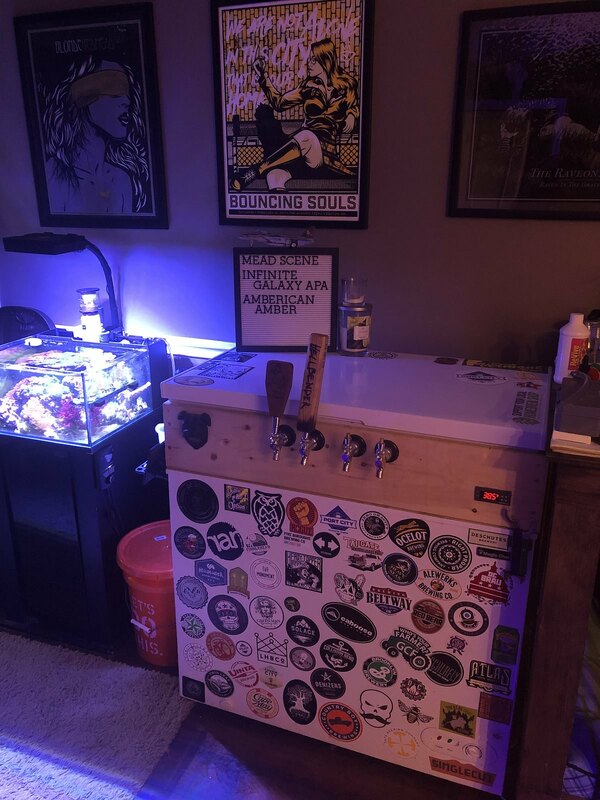 I'm traveling so much lately that I don't have time to drink all the beer I make, and that's not including the beer fridge on the side for all the cans/bottles. My house beer is a Cream Ale, and I usually keep a Gose on tap, probably my favorite style. I have 10 gallons of mead mellowing out from a year and a half ago, and keep a line dedicated for kombucha or cold brew. My next addition will be a nitro tap off the side. I just returned from Denver last week from the Craft Brewers Convention, which was oddly familiar after being there for MACNA in 2014. Man, I got a soft spot in my hart (and probably my liver) for mead. Just opened a 2009 bottle. I know I guy who uses his skimmate as a fertilizer to grow weed and swears it somehow makes it magical. Weed is not my thing and I don"t think skimmate would work well for brewing. We have all seen some beautiful thriving reef tanks run on some very modest equipment, and, more often the inverse. I find homebrewing is the same way. Can't buy experience and a solid process but well designed quality equipment sure helps. I have heard good things about the Grainfather. Did you get the expanded grain bin that can do a almost 20lb grain bill? I am still doing 5 gallon beer batches and brew two or three times a month. I do 12 gallon wine batches. We entertain quite a bit. I keep 12 five gallon kegs full - six on tap (two taps are nitro), two in cold storage and four at room temp. So nice to run into another reefer here on the home brew talk site. Sounds like fun! Will also trade beer for cheap frags. I was able to edit the original post and re-upload the photos. Don't know why they were down. The only adjustments/extras I went with were the Grainjacket (which honestly does a better job of keeping me from burning my shins then it does insulation). Sounds like you're halfway to running a production brew house, lol. I do not entertain much, and find most of my stuff gets consumed by yours truly, or growlers I fill up for parties or when I go to friends houses. I do still try and brew x2 a month. What does cold side look like for you? *Edit* Just looked over your blueprints and saw you had a glycol system, get outta here! Stainless conical, or are you using carboys? One is on my reef tank and the other is on my brewing fermenter setup. It hard to see in the photo but the chiller is on the lower shelf. There are three pumps in a glycol bath in a cooler behind the fermenters. Each pump is on a separate controller. One is set to 28F and powers on the chiller and the chiller pump. The other two each maintain a fermenter with a stainless coil in each. They are two stage controllers with heating pads under them. Works great. I can cold crash both of them down to 37F easily. I also use it for my yeast starters. The thing on the left in the photo is a stainless pot with a stir plate mounted under it and a cooper coil in it. I put the 2L starter in it and set the temp and that is it. Goes from a boil to pitch temp in about 12 min and then holds that temp. My lager beers are always the first ones to kick when entertaining but I still make lots of ales. The lagers take longer to make and its kind of a hassle to manually do the dozen or so temp step ups and downs. Surprisingly, it's been a game changer for my non-lager high gravity beers. I pitch at the cold range of the yeast to slow it down and keep the yeast from getting too sloppy and slowly ramp up the temp until the style yeast has gone as far as it can. I then pitch and re-pitch a champagne yeast. I have gotten some 12% barley wines to come out very crisp and clean with this glycol setup. I don't use stainless fermenters. Just cheap and easy Speidel 30L. I have four, two on the glycol and two off. Stainless is a little easier to clean but harder to insulate. I have five 6 gallon Better Bottles and a glass carboy I use to filter with a vacuum sealer. The fourth kettle on the right is a steamer for crabs and lobster bakes. Not part of the brew setup but just as important. My only burner is a single 3500 Watt induction burner. I pump my sparge water from the BK with a stainless coil in it to my HLT with no coil. I'm sure that sentence will make complete sense to everyone here on WAMAS. Cheers to thriving yeast in your fermenters and thriving bacteria in your reef tank.